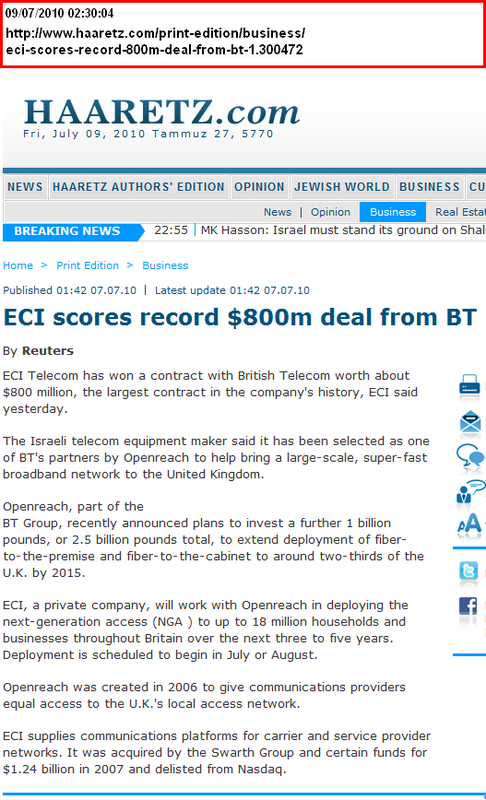 Electronics Corporation of Israel (ECI) Telecom has been selected by British Telecom to help upgrade the UKs broadband infrastructure. 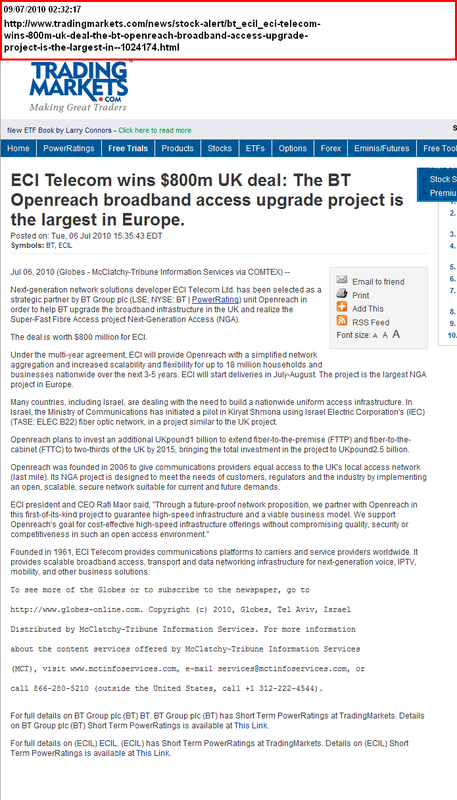 The contract is worth $800 million (£526 million) - the largest contract in ECI's history. 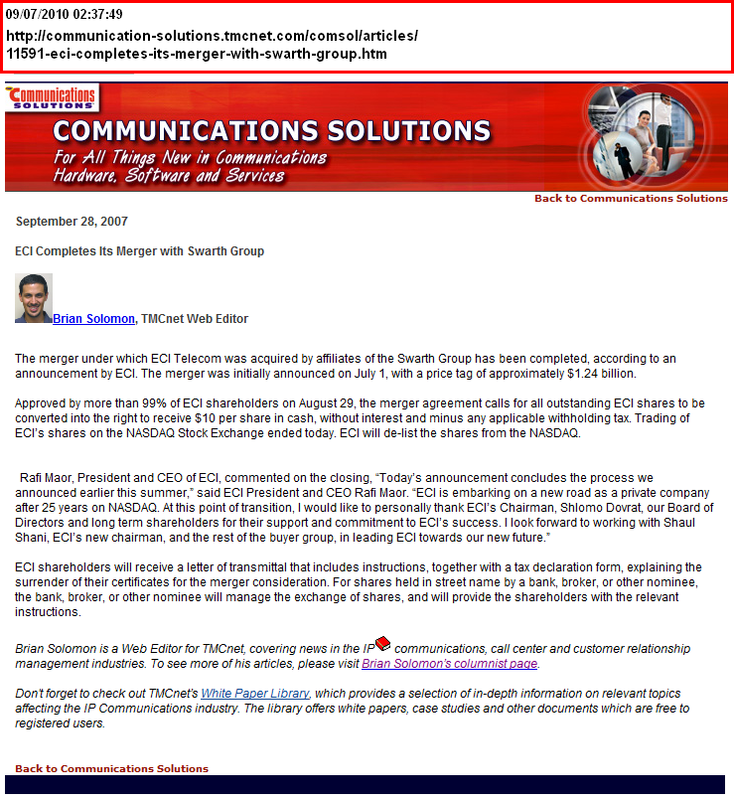 ECI has from its inception been a military contractor for the Israeli Army, as its website testifies: "ECI's military communications pedigree stems from its Israeli heritage. For nearly 45 years, ECI has worked closely with the Israeli Defense Forces (IDF) and other defense forces to provide solutions that meet the most stringent military requirements for strategic communication infrastructures." 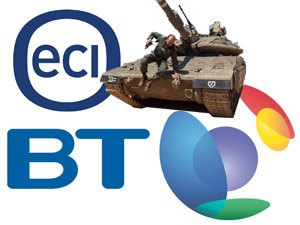 ECI is "the IDF’s leading telecommunications vendor".They help underpin Israels occupation by providing the IDF with its network infrastructure linking their military bases, and providing border security networks. 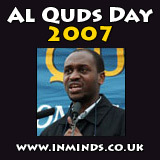 For nearly 45 years, ECI has worked closely with the Israeli Defense Forces (IDF).. 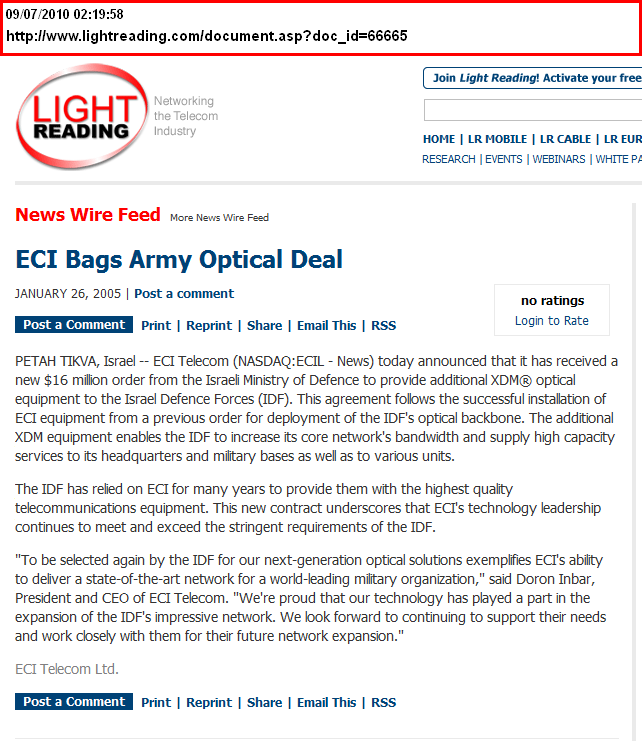 When EDI was selected by the IDF in 2005 to provide additional optical backbone for its military bases in a $16 million deal, ECI President and CEO Doron Inbar said: "To be selected again by the IDF for our next-generation optical solutions exemplifies ECI's ability to deliver a state-of-the-art network for a world-leading military organization. We're proud that our technology has played a part in the expansion of the IDF's impressive network. We look forward to continuing to support their needs and work closely with them for their future network expansion." In pitching their military products to clients around the world ECI gains a competitive edge by marketing their products as having been tested by the IDF, "battle-proven" in a real conflict zone. Their marketing blurb reads: "Experience and expertise: You should not settle for less than the best. 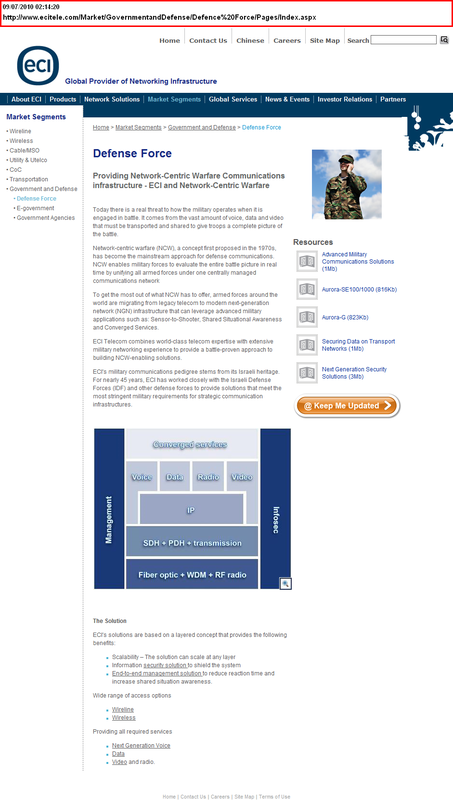 Through ECI’s close collaboration with the Israeli Defense Forces (IDF) and other leading armies in the world, ECI has accumulated an unparalleled knowledge and skill base to help you achieve your goals"  ECI's "Advanced Military Communications Solutions" brochure boast that its "exclusive advantage" is in its "proven military" experience. Their experience in border security in the occupation is now sold as a 'Border Protection' product. 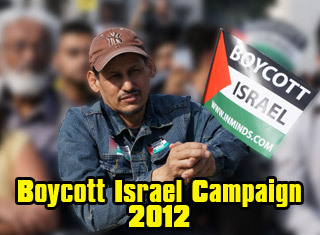 Apart from being a key contractor for the IDF, ECI also support the IDF is other ways. 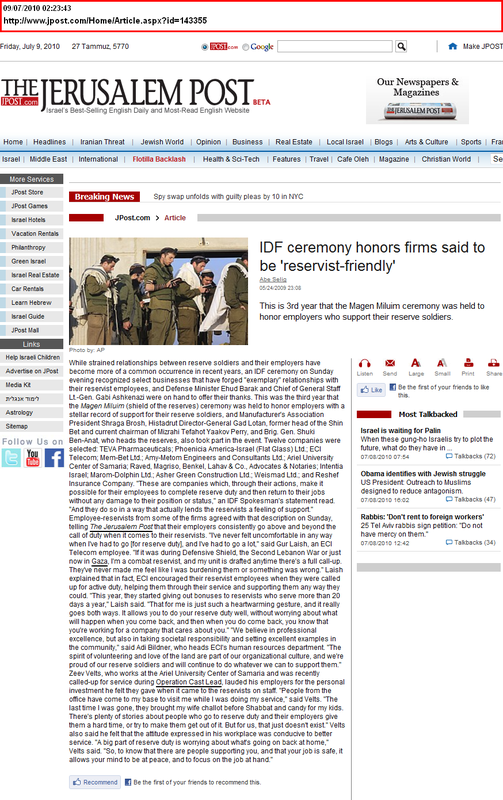 In May 2009 the IDF honoured 12 companies who have "a stellar record of support for their reserve soldiers". ECI was was amongst those honoured by Defense Minister Ehud Barak. After the Israeli attack on Gaza in 2009, ECI started giving out bonuses to any of its employees who serves in the IDF for more than 20 days in the year. 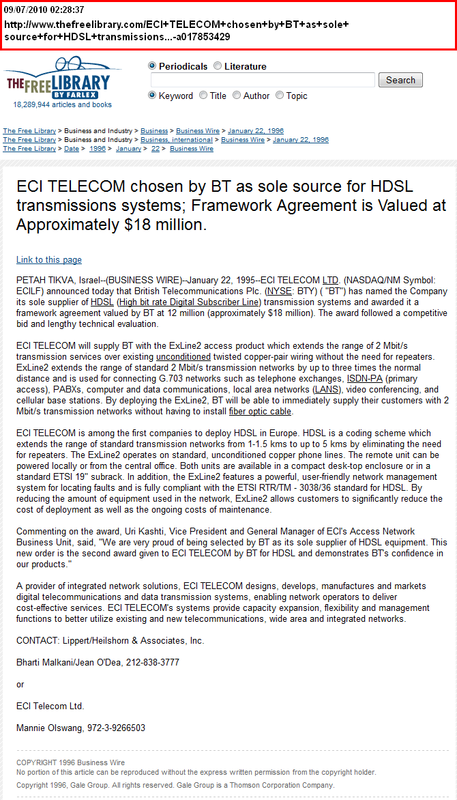 Since entering the civilian market, ECI has been a major supplier to BT over the last 26 years. 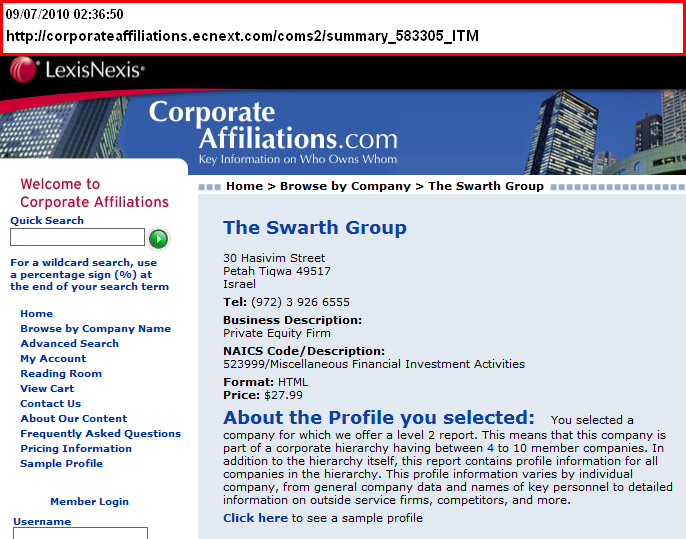 In 2007 ECI was bought out by private Israeli equity firm The Swarth Group for $1.2 billion.